The patent pending Handy Bed 3x3 has been designed for the Square Foot Gardener with inside dimensions of exactly 36 in. x 36 in. square (outside is 38 in. x 38 in.) It is constructed of durable UV protected PVC (Vinyl) that will NEVER ROT like wood or lose its white color. It offers a Lifetime Warranty against peeling, flaking, blistering, corroding, rotting, fading and manufacturing defects. Its simple design allows almost anyone the ability to assemble in minutes with only a cordless drill with #2 Phillips bit. Stainless steel screws add strength where it counts allowing the Handy Bed to be relocated year after year after year if desired. Something most other beds cannot. Its 6" depth is adequate for growing most veggies and flowers. The bed can be placed at any level location where adequate sunlight for desired plants is available. The 3'x3'x6" Handy Bed holds approximately (6) 40lb bags of topsoil or 4.5 cu. ft. The PVC is self cleansing from the rain or simply use a garden hose to spray off excess dirt. For stubborn stains, use soap and water. This bed is stackable with another Handy Bed of the same size by aligning the tongue and groove joints allowing the next Handy Bed to sit right on top of the lower unit for more soil depth and/or tiering. 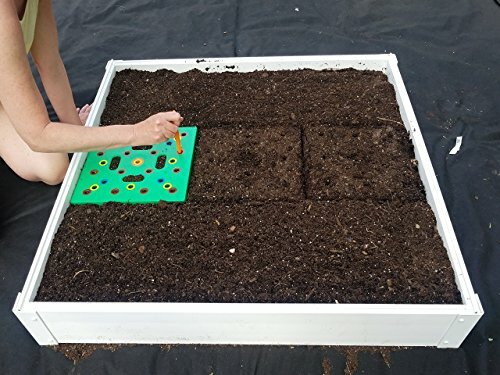 The elements associated with weather, soil and water make Vinyl (PVC) the right choice for your raised beds to endure many years of successful growing. If you have any questions about this product by Handy bed, contact us by completing and submitting the form below. If you are looking for a specif part number, please include it with your message.